Tuition and fees deduction. If you paid qualified tuition and related higher education expenses, you may be able to deduct as much as $4,000 of those costs. This can be done on a regular return (without itemizing). The deduction is capped at $4,000 for single filers with adjusted gross income (AGI) of $65,000 or less ($130,000 joint) and at $2,000 for single filers with AGI of $80,000 or less ($160,000 joint). Mortgage insurance deduction. If you paid mortgage insurance premiums, you can now once again deduct those amounts as an itemized deduction. 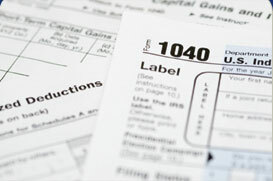 This deduction begins to phase out for taxpayers with AGI of $100,000 or more. Mortgage debt forgiveness exclusion. If qualifying mortgage debt on your primary residence was discharged or forgiven, you can exclude that amount from your income. Energy-efficient home improvement credit. Energy-efficient home improvements (such as upgrades to windows, or heating and cooling systems), may be eligible for a tax credit equal to 10 percent of the amount paid, up to $500. These are just a few of the questions people have during tax season. If you have more, don't forget to bring them to your 2017 filing appointment. Contact us for more information. Starting your own business can be equal parts thrilling and intimidating. Complying with regulations and tax requirements definitely falls into the latter category. But, with some professional help, it doesn't have to be that way. You can get started with this checklist of things you'll need to consider. Are you a hobby or a business? This may seem basic to some people, but the first thing you'll have to consider when starting out is whether you really are operating a business, or pursuing a hobby. A hobby can look like a business, but essentially it's something you do for its own sake that may or may not turn a profit. A true business is generally run for the purpose of making money and has a reasonable expectation of turning a profit. The benefit of operating as a business is that you have more tax tools available to you, such as being able to deduct your losses. Pick your business structure. If you operate as a business, you'll have to choose whether it will be taxed as a sole proprietorship, partnership, S corporation or C corporation. All entities except C corporations "pass through" their business income onto your personal tax return. The decision gets more complicated if you legally organize your business as a limited liability corporation (LLC). In this case you will need to choose your tax status as either a partnership or an S corporation. Each tax structure has its benefits and downsides - it's best to discuss what is best for you. Select an accounting method. You'll have to choose whether to use an accrual or cash accounting method. Generally speaking, the accrual method means your business revenue and expenses are recorded when they are billed. In the cash method, revenue and expenses are instead recorded when you are paid. There are federal rules regarding which option you may use. You will also have to choose whether to operate on a calendar year or fiscal year. Create a plan to track financials. Operating a business successfully requires continuous monitoring of your financial condition. This includes forecasting your financials and tracking actual performance against your projections. Too many businesses fail in the first couple of years because they fail to understand the importance of cash flow for startup operations. Don't let this be you. Prepare for your tax requirements. Business owners generally will have to make quarterly estimated tax payments to the IRS. If you have employees, you'll have to pay your share of their Social Security and Medicare taxes. You also have the obligation to withhold your employees' share of taxes, Social Security and Medicare from their wages. Your personal income tax return can also get more complicated if you operate as one of the "pass-through" business structures. This is just a short list of some of the things you should be ready to discuss as you start your business. Knowing your way around these rules can make the difference between success and failure, but don't be intimidated. Help is available so don't hesitate to contact us if you have any questions. • Tax return tip: The cost of having your 2017 tax return prepared qualifies as a deductible miscellaneous expense. • The cost of searching for employment may also qualify as a deductible miscellaneous expense, even if you don't get the job. This deduction is no longer available in 2018, so take advantage of it now on your 2017 tax return if you can. Questions? Contact us and we can help you.